I rely so heavily on my computer that when something goes wrong it feels like my whole life falls apart. I need it for my design work, for blogging, for video editing, for emails...it practically IS my life. (Is that sad?) I may or may not have had a mini-crisis over it this weekend. Thankfully, my PC is back in working order, all my programs are functioning, and I re-made all my custom Photoshop brushes. Now, let's get back to business and celebrate this awesome news with some beautifully packaged gummy candies! Due to it's itty bitty size you'd think this plastic pouch would easily be lost in the crowd, but it's colorful design caught my eye right away. 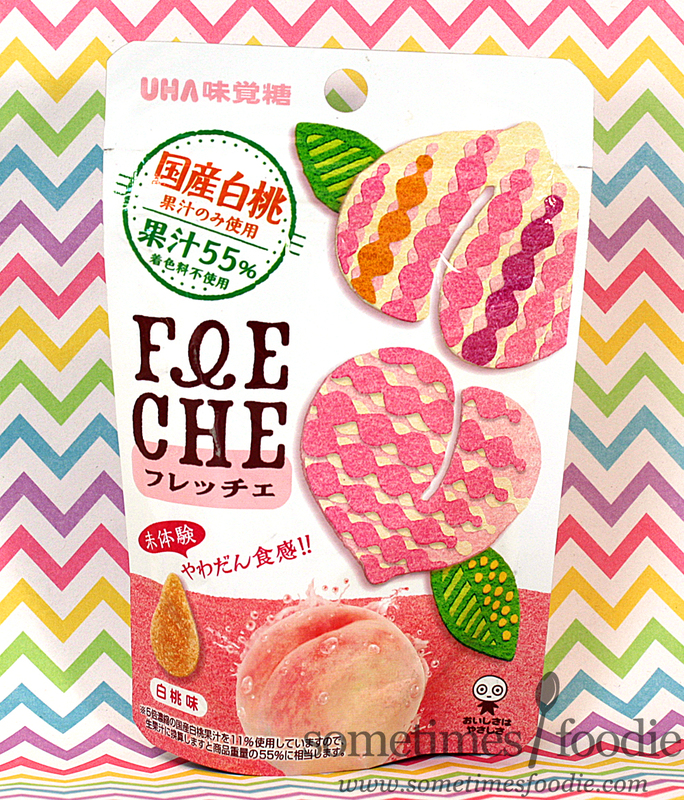 The resealable bag is made of foiled plastic, and the design used a peachy color palette with hints of texture and patterns to keep things interesting. The wiggly lines remind me of rick-rack. (Where my sewing people at?) 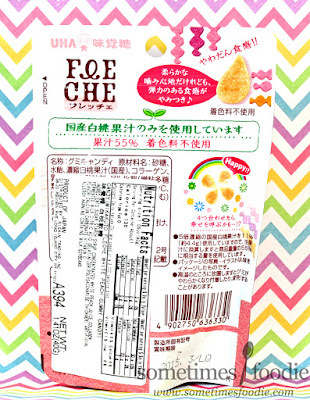 Other than the brand's name, Fleche, I can't read any of the information seen on the front of the package, but I can guess that these are made with 55% real fruit/juice, and they've got some kind of wow-worthy coating. Maybe fizzy or sour? I turned the pouch over and the cute layouts aren't limited to the front. Once the plastic bag has been opened, the candies inside smell like peach nectar. The aroma is jammy, and authentic, but intensely sweet. In a way it reminds me of overly ripe fruit. I reached into the bag and...oh boy. Pretty sure they're not supposed to look like this. A quick google search confirmed that something about these candies was off. Normally they're covered in a layer of sanding sugar, like gumdrops, but that's nowhere to be found. That means these gummies got a little steamy during their travels to the great state of New Jersey, and even though they're sticky and not-as-cute looking, I'm still going to eat 'em. Due to the stickiness, the candies were tough to get out of the packaging, but I managed to get one out and toss it into my mouth anyway. 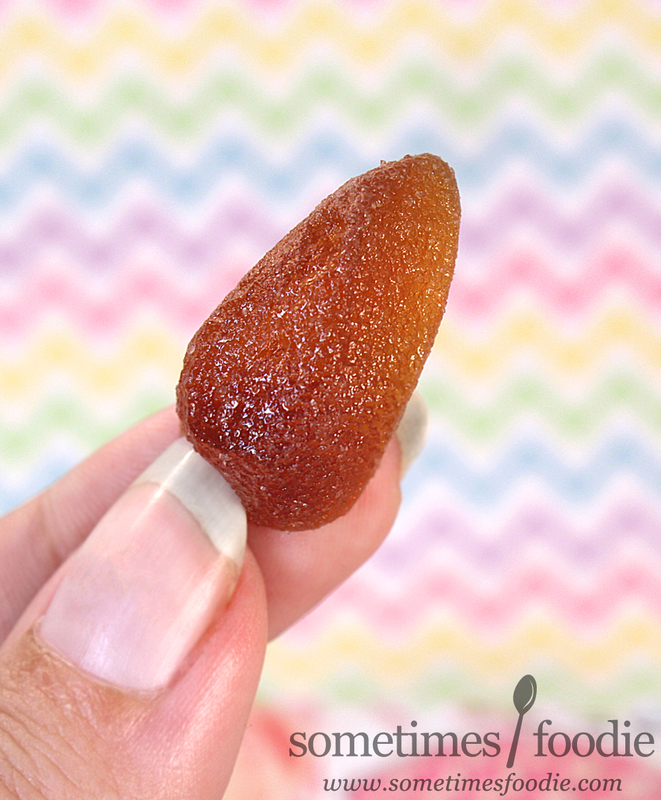 It has a slightly tangy exterior with a powder-like feel, which is bizarre because it looks really wet and greasy, but once you get through that sour layer the gummy underneath is sweet and fairly authentic tasting. I'm guessing these used to have sour sanding sugar on the outside, like Sour Patch Kids, and even though the gritty texture isn't there anymore, there's still a sour punch to these peachy sweets. I'd liken these to peach preserves with a hint of citric acid. It's also worth mentioning that the texture is really soft, similar to a jelly or Turkish delight, not stiff like a Haribo or Kasugai gummy candies.